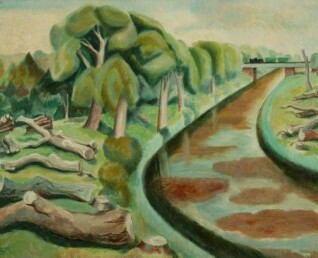 The location of the painting was under question by Martin Hopkinson: was it the Royal Military Canal between Rye and Appledore? The Group leader for the South East England Group, Grant Waters, agreed that the work was painted around Romney Marsh, but wanted to contact the artist's son. It was thought that other work (Martello Tower) in Manchester City Galleries by the same artist, was also thought to be painted in the area of Romney Marsh. Manchester City Galleries commented on the discussion noting that when the painting of Martello Tower was gifted to them in 1997 the artist’s son gave an alternative title of ‘Martello Tower – Suffolk coast’. Grant was able to confirm with the artist’s son that the work does depict the Royal Military Canal in Romney Marsh, but the exact location cannot be confirmed. New descriptions were added to both paintings. Could this be the Royal Military Canal in Romney Marsh?